What kind of Pittsburgh do you want? 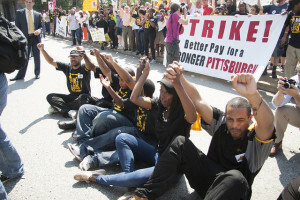 On Thursday, fast food workers were arrested in a nonviolent civil disobedience protest outside a Wilkinsburg McDonalds, joining other fast food workers around the nation who walked off the job in a massive demonstration demanding $15 an hour and a union. Last week, thousands of people answered that question, calling for better jobs and better communities. Just days earlier, UPMC and fast food workers stood with casino workers, security officers, adjunct instructors and retail workers in Pittsburgh’s annual Labor Day parade, where they marched alongside union leaders, community members and elected officials to say working families want a city with good union jobs to help lift themselves out of poverty. 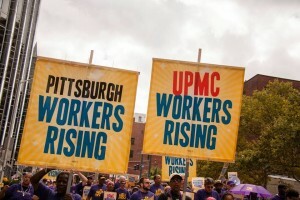 UPMC pays thousands of front-line healthcare workers 8% to 30% less what it takes to live in Pittsburgh, making it impossible for them to get by. 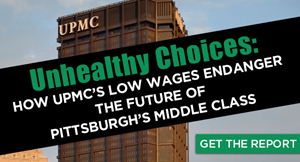 For the cost of UPMC’s $51 million corporate jet alone, the institution could raise all of its Pittsburgh service workers to a median wage of $15 an hour. 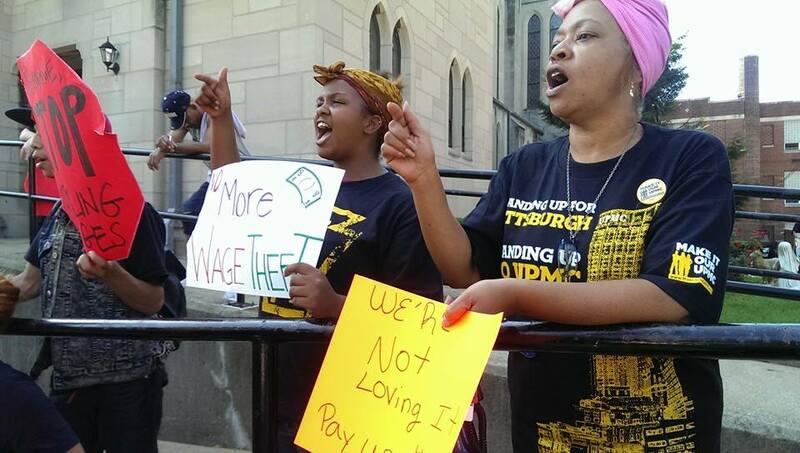 The fast food strike follows city-wide protests on July 30, when more than 30 members of the clergy, community leaders, students, and UPMC workers were arrested calling on UPMC to stop standing in the way of healthcare employees who want a union. 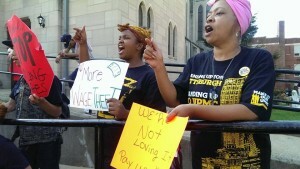 UPMC Worker, Leslie Poston, joined in support of Fast Food workers across Pittsburgh as part of a national day of action. 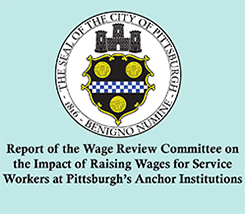 Keystone Research Center economist Stephen Herzenberg wrote recently in the Post-Gazette that lifting UPMC wages would have an effect on the broader service sector of retail, caregiving, and restaurants as those jobs cannot move offshore. The people who prepare and serve our food, clean our hospitals and teach our kids should not have to work overtime just to scrape by. With the support of the community, Pittsburgh workers from every sector are standing up to their employers and saying we need an economy that works for everyone. Together, we can raise up Pittsburgh!